The role of oocytes in follicular antrum formation is not well understood. 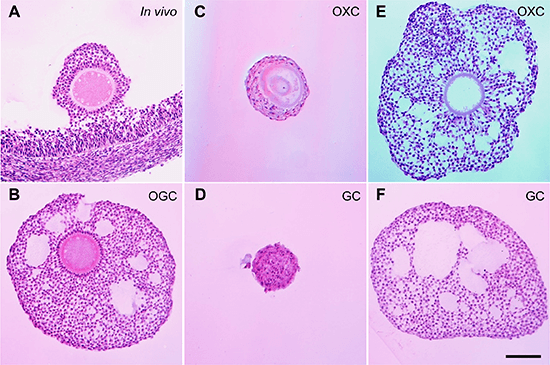 We examined the effect of oocyte-derived growth factors, growth differentiation factor 9 (GDF9) and bone morphogenetic protein 15 (BMP15), on the formation of antrum-like structures by cultured bovine oocyte-granulosa cell complexes (OGCs). OGCs containing growing oocytes (105‒115 µm in diameter) were collected from early antral follicles (1.2‒1.8 mm) and used to prepare oocytectomized complexes (OXCs) and granulosa cell complexes (GCs). The mRNAs of GDF9 and BMP15 were expressed in the oocytes, but not in the granulosa cells. The complexes were cultured for five days with or without GDF9 and BMP15 either alone or in combination. The OGCs maintained their complex integrity and developed antrum-like structure, whereas OXCs and GCs neither maintained their integrity nor developed any antrum-like structure without growth factors. GDF9 or BMP15 alone increased the integrity of these complexes and induced antrum-like structures in OXCs and GCs. Moreover, the combination of GDF9 and BMP15 was more potent for both phenomena in all types of complexes. In OXCs and GCs cultured without GDF9 and BMP15 or with BMP15 alone, outgrowing granulosa cells differentiated into fibroblast-like cells. The combination of GDF9 and BMP15 suppressed the appearance of fibroblast-like cells in OXCs and GCs during incubation. Instead, the granulosa cells appeared rhomboid and pebble-like in shape, similar to those in OGCs cultured without supplementation of GDF9 and BMP15. These results suggest that oocytes maintain complex integrity by preventing granulosa cell differentiation and participate in follicular antrum formation via GDF9 and BMP15.